I bought ready-made puff pastry that didn’t require rolling out- just thaw and use. Pampas Puff Pastry sold in Phoon Huat is cheaper ($6.20 I think) as compared to another brand I bought from NTUC, and they tasted just as good. There are six sheets inside and each sheet makes 4 puffs the size of macdonald’s apple pies. Heat abt 2 tbsp of oil and fry potatoes with abt 4 fl oz of water and 1/2 tsp salt until soft. Set aside. In a clean wok, heat 2 tbsp oil. Fry the onion until transparent. Brown the diced garlic. Add mixed vegetable, mushroom, chicken. Fry for a while to break up chicken. Add in potatoes. Add in abt 4 fl oz of water and cook for abt 5 mins. Add in salt, sugar and pepper. Add in the cornstarch and stir to thicken mixture. Set aside for later use. Slice a square puff pastry sheet into four. To make triangular puffs, simply spoon some filling onto the small square and halve it into a triangle. Seal the sides tightly with the back of a fork and cut 4 deep slits on the surface. Brush the top generously with beaten egg wash. Please don’t stuff the puff with too much filling because the puff will explode later! For the same reason, cut the slits nice and deep for the hot air to flow out when the puff is baking. To get an even golden brown top, don’t hesitate with the egg wash.
A few days later I also made Apple Custard Puffs and Apple Strudel with a few friends. Both were delicious, especially when paired with Dreyer’s Vanilla Ice-cream. Heat a saucepan over medium heat. When hot, add in the butter and let it melt. Add in the apples and stir such that all the apples are coated with the butter. Allow the apples to be cooked thoroughly , this will take about – 10 minutes. Stir the apples occasionally to prevent burning. Meanwhile, mix the corn flour, lemon juice and zest in a small bowl and save for use later. Once the apples are cooked, stir in the sugar and continue stirring till all the sugar has melted. Add in the raisins and cinnamon and continue stirring for a few minutes. Add in the corn flour and juice mixture and stir. Allow the sauce to thicken and remove from heat. Allow the apple filling to cool. Add warm milk into the yolk-sugar-flour mixture slowly and mix well. Remove the pot from the heat and stir in the melted butter. Cool the custard cream in the refrigerator to let it thicken somemore. Combine castor sugar and cinnamon in a bowl and set aside. Cut the puff pastry according to how big you want it. I made rather small ones, 2 layers with each sheet of puff pastry cut into 3. Cut each sheet of puff pastry into 3 equal rectangles. 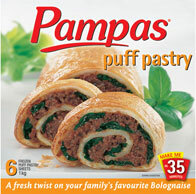 Place it on a well greased baking tray, apply egg wash on the puff pastry. Sprinkle the mixture of sugar and cinnamon over the puff pastry. Repeat this step with the other 2 sheets of puff pastry. Bake in the oven at 180 deg C for 15 to 20 minutes until golden brown. Once baked, remove from oven and allow to cool on a rack. Lay one puff pastry baked on your work surface. Spread the chilled custard cream over the layer of puff pastry. Spread a portion of apple filling on top of the custard cream and puff pastry. Place another layer of puff pastry on top. Make sure you divide your apple filling and custard cream well to ensure that there is enough for all your strudels. Repeat for the rest of your strudels. We used the same custard and apple recipes to make the custard apple puff. The best thing about puff pastry is you can leave it frozen in the fridge and use it at your own convenience. The buttery and flakey layers go with just about anything, from sweet to savoury.